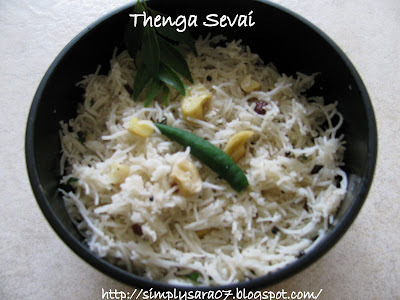 Thenga Sevai is a traditional South Indian Dish. I usually make Thenga Chadam thats Coconut rice which is very tasty to eat. So tried to make Thenga Sevai this time. This is usually done on many occasions for Tiffin. You can use home made sevai or rice vermicilli. In a kadai, add oil, mustard, asafotida and wait till it spulters. Add bengal gram and wait till its brown. Add cashews, curry leaves and green chilli and saute. Add Grated coconut and saute for sometime. Mix well and cook for few mins and off the stove. Thenga Sevai is ready to eat. You can enjoy this as it is or with vadams or chutney. Thenga Sevai is going for Let's Go nuts event hosted by Padmaja of Seduce ur taste buds blog. 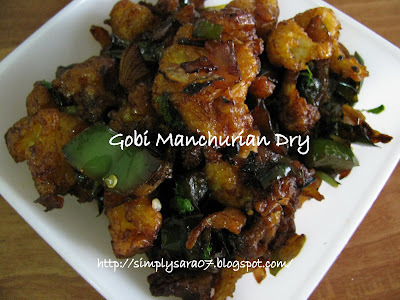 Gobi manchurian is a very famous Indian-chinese starter. I love gobi manchurian dry. I never miss to have in Shanthi Sagar, Bangalore when I go home. Have seen many small shops for only Gobi and Fried rice. I was missing Gobi manchurian and tried preparing last weekend. It was very good and yummy. Kesari colour a pinch - Optional I have not used. Make small florets of it. Put in boiling water with little salt and a pinch of turmeric for 10minutes. Drain/Strain fully so no water is left. Deep fry in oil and keep it separately. Then add chopped capsicum and saute. Add crispy cauliflower and mix. Add all the sauces and mix. If required all some more sauce. Enjoy the delicious Gobi manchurian Bengaluru style. Notes - Since I don't use garlic at home hence its always Optional. 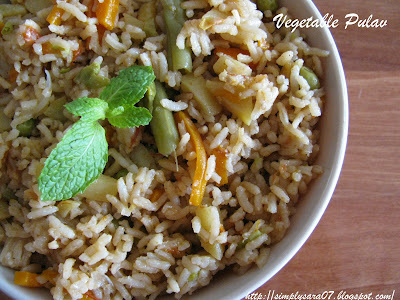 Vegetable Pulav is very tasty rice. This can be had for lunch or dinner. Remove skin and chop Potatoes and carrot. Chop Beans, tomato and onion into lengthy pieces. Heat a kadai or pressure cooker, add oil and spices. Saute for 2 minutes. Then add onion and saute till its transparent. Now add ginger garlic paste and saute till raw smell is gone. Add tomatoes and saute till its soft. Add garam masala powder, salt and mix well. Add all vegetables, green chilli and saute till all masala mixes well. If using kadai transfer all to a pressure cooker. Vegetable Pulav is ready. Enjoy hot pulav with Raitha. Wash Potatoes remove skin and cut into thin strips. Keep it on a clean cloth and remove excess water. Heat oil in a kadai, drop these potato strips when the oil is very hot. Leave it till its slightly brown and then remove. Sprinkle salt on the potatoes. This French Fries recipe is going for Fried Snack Event by Easy Crafts. Wash and clean pudina leaves. Heat a kadai, add oil and urad dal. Fry till its brown. then add green chilli, tamarind, pudina and fry till its soft. Then grind in mixie with salt to a coarse paste. It can be served with Dosas and Idlis. I have used mini idlis which I made for my son and was leftover. Cut Idlis in 2 (mini idlis) or 6 (normal idlis) as desired. In a kadai, put oil mustard wait till it splutters. Then add asafotida and dals. Wait till its brown. Now add jeera, curry leaves and green chilli. Saute for a minute. Slowly add yogurt and keep stirring. After a minute add chopped idlis and salt mix well. Remove from the stove. Allow it to cool and keep in fridge for 1 to 2 hours. If you do not want to refrigerate you can keep for about half n hour so the yogurt is absorbed and serve. Remove from the fridge stir once, garnish with chopped coriander leaves and Serve. Chilled Idlis are ready to eat. This can be done with leftover idlis too. Bachelor's you can try this easy and simple recipe. This recipe is going for Show me your Breakfast by Divya Vikram. Wash and soak the above ingredients for about 5-6 hours in water and then grind to a fine paste. Dosa Batter (Dosa Maav) has to be fermented for overnite or for about 4-5 hours. Then Heat a pan either non stick or normal one. Heat the pan in medium or low flame and spread batter slowly thick and thin. Put one tspn oil and close with a lid. Check whether its well cooked thats it will be brown and crisp on the thin spread and dull white on think spread. You can even spread onion, garlic and red chilli chutney and put aloo masala. 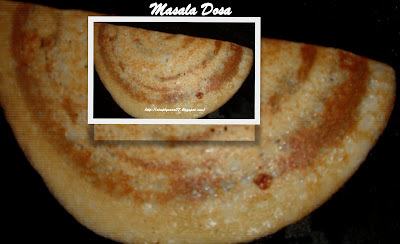 Masala Dosa is ready to serve. It can be served with Coconut chtney / Sambar. This Masala Dosa recipe is going for Dosa Corner Event hosted by Padma's Recipes and Show me your Breakfast by Divya Vikram. Heat the pan always in medium or low flame spread batter and then increase flame. You can rub the pan with sliced onion. Always make first dosa very small and then later dosas can be made big. Sometimes batter will stick. When kept in fridge, keep the batter outside about 1/2 hour before making dosas, If the batter is chill then also you cannot spread the batter easily. If you do not have so much time in grinding batter at home you can also buy ready to make wet dosa batter which is easily available in super markets. 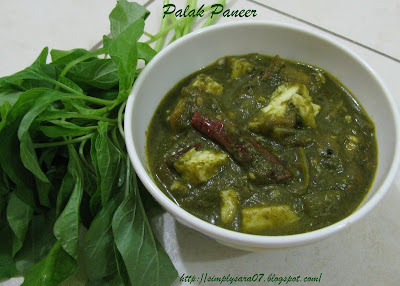 Palak Paneer which I made last weekend at home. This is a very tasty gravy prepared with fresh spinach and Paneer(Cottage Cheese). 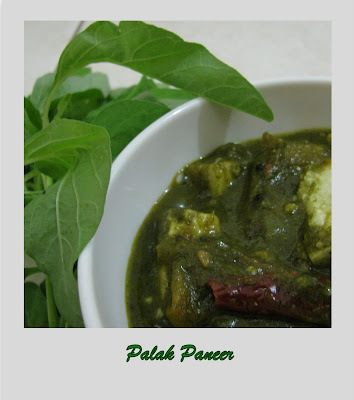 This dish Palak Paneer is speciality of Northern India. We had this with chapathi as side dish. It was very tasty and yummy. Seeing fresh spinach in market made me to buy, usually I prepare Keerai Kootu a South Indian gravy and for a change I prepared this dish. In my recent post you might have read how to make paneer at home, if not click here. Here I go with the recipe. Hope you all enjoy this recipe. Preparation MethodChop onion and tomato to medium size cubes. 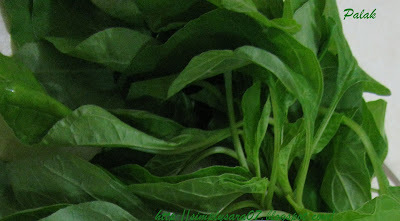 Separate spinach leaves from the stem and wash thouroughly. In a vessel keep water for boiling, keep sufficient water to drop spinach in it. Once its boiling off the stove, put these spinach and leave it till you are doing other things. In a Kadai, put little oil put spices and fry for a minute. Then put onion and fry till its transperent. Then add tomato and fry till it cooks well. Add litte salt. Keep it in low flame. Filter spinach and grind in mixie to a fine paste. Mix the paste with onion and tomato mixture and boil it. Add salt, garam masala and red chilli powder. Keep it in low flame. In a sauce pan, put 1 tspn oil and fry paneer for few minutes. Mix this with the gravy. Let it cook for few minutes in low flame. In the same sauce pan, put 2 tspn oil, mustard wait till it splutters, add red chilli and cumin seeds. After 2 minutes its done. Mix all the above with Palak Paneer. Dahi Sev is very tasty. You can say it a chaat or salad. Its from North India. Its a mix of Dahi called yogurt(curds) in Hindi and Sev a fried savoury. It is very simple and easy to prepare. In a bowl mix onion, tomato with a pinch of salt. Then beat dahi to smooth then mix. Top it up with Sev, chaat masala and Kothmir. Yummy Dahi Sev is ready to serve. Eat immediately after mixing before sev becomes soggy.